Beauty Expert's Advent Calendar for 2018 is here. It contains 12 products, all full-sized, with a net worth of £450. The calendar costs £100 and ships worldwide. The calendar is spa-centric, and primarily has skincare and bath and body products. Even so, there are two makeup products. The packaging is beautiful, and indicates the luxurious brands included. Inside, you have 12 drawers. The material is sturdy, thick cardboard, and you can repurpose the box to store lipsticks, or makeup brushes. I use it to organise my makeup brushes. Very handy. You can view my 2017 unboxing and review here. Scroll down for the contents and spoilers of the Beauty Expert 12 Days of Christmas Advent Calendar 2018. Refresh your skin in an instant with this revitalising facial mist from Hungarian Spa brand Omorovicza. Formulated with Hungarian Thermal Water, spritz for long-lasting hydration and radiance. The cult Eve Lom cleanser is a must-have for any beauty aficionado. Paired with an Eve Lom Muslin Cloth for the ultimate Eve Lom experience, apply this indulgent balm cleanser to deeply cleanse and add moisture to the complexion. The classic blend of Clove, Eucalyptus, Egyptian Chamomile and Hops melts away makeup and gently decongests without stripping the skin. Part of the new Peptide4 range, the Elemis Peptide4 Night Recovery Cream-Oil is a revolutionary hybrid skincare product that combines the benefits of a moisturiser and facial oil in one antioxidant-rich formula. Powered by a blend of Perilla Seed Oil, Night Scented Stock Oil and Elemis’ tetra-peptide technology, the ingredients work in synergy to restore and replenish moisture to the skin. The perfect product for an at-home facial massage, ESPA Optimal Skin Pro Serum utilises key ingredients of Echium Oil, Sunflower Concentrate and Turmeric to improve skin elasticity and add a level of natural radiance to the skin. A unique serum with the texture of an oil, this is an anti-ageing saviour that will slot perfectly into your current skincare routine. To create the perfect base for makeup, the Illamasqua Hydra Veil Primer smooths the complexion, allowing you to apply makeup evenly and effortlessly. Packed with hydrating ingredients, the skin is left feeling balanced and prepped for makeup application. Keep your lips smooth and free from dryness by applying the newly reformulated NUXE Rêve de Miel Lip Balm first thing in the morning and topping up throughout the day. This lip conditioning product is infused with honey and botanical oils to create an irresistible level of softness. A classic range from Molton Brown, Pink Pepperpod is a fresh but energising fragrance that makes a luxurious body wash. Lightly fragrancing skin with the invigorating scent, this hero body care product also conditions the skin whilst washing away daily impurities. An incredible 100% natural facial oil, the Balance Me Radiance Face Oil is ideal for those with dry, dehydrated or pigmented skin. Delivering long-lasting hydration and anti-ageing benefits, this multi-tasking oil is the perfect final step in your evening skincare routine. Unwind after a long day with the Aromatherapy Associates De-Stress Muscle Gel, a relaxing body product that relieves muscles of daily aches and pains. Apply post-shower and massage well until the product is absorbed. Red lipstick is a classic makeup look that complements all skin tones. The Lipstick Queen Sinner Lipstick is a long-wear formula that keeps the colour locked in place with minimal need for top-ups. Designed to target the visible signs of ageing, namely fine lines, dark circles and puffiness, the Madara SMART Antioxidants Anti-Fatigue Rescue Eye Cream is a replenishing formula that keeps the under-eye area conditioned and protected. Powered by a host of natural active ingredients, your skin will appear noticeably brighter, with a lifted effect. A daily moisturiser that suits all skin types, the Doctors Formula Marine Collagen Anti-ageing Day Moisturiser delivers a surge of moisture and boosts the skin’s natural barrier. Ingredients work in synergy to prevent water loss and improve the skin’s elasticity, firmness and suppleness. So. 12 products. All full-sized. Some lovely facial oils and serums, and moisturisers in here. I love the Omorovicza Mist a LOT. Good to see two makeup products in here as well. I'm most excited about the ESPA serum and the Doctors Formula moisturiser. Not to mention my firm favourite, Molton Brown. That said, I would have liked to see another Eve Lom product in lieu of that cleanser. When we heard spoilers, I hoped and prayed it wouldn't be the ubiquitous cleanser, but here we are. That's a shame, because I myself have received at least half a dozen of these, and would love to try something new instead. This is a very solid advent calendar, and is definitely worth a lot more than the cost price. A great bargain for skincare junkies, and anyone who enjoys a bit of pampering over the Holiday season. 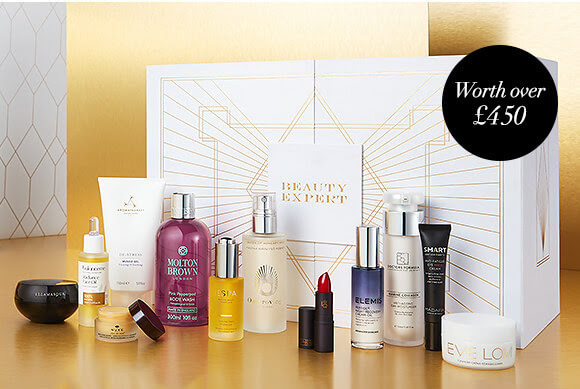 The Beauty Expert 12 Days of Christmas Advent Calendar 2018 is available here. They ship worldwide for FREE, so what's not to love? Will sell out VERY quickly, so hurry!